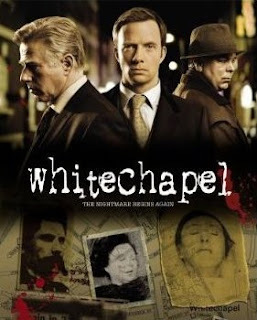 Although a film about Jack the Ripper should ideally be viewed in the fall, the suitably creepy new series Whitechapel makes for interesting viewing no matter what the season. The setting for this latest telling of the JTR story is modern day East London. The dapper new DI Chandler is assigned to oversee a motley bunch of coppers who are investigating a brutal murder. The slovenly, somewhat lazy group is none too happy to be ordered around by the new boss, and they really resent it when he starts telling them how to eat, how to dress, and offers up suggestions on the use of deodorant. You'd hardly think those lessons would be needed in 2009, but I guess there are still pockets of unprofessionalism in all professions. A Ripperologist who has spent his life studying the case notices similarities between current murders and the unsolved cases from 1888. He brings it to the attention of the police, who at first refuse to believe his claims. Soon, however, it becomes all too app arent that there is a copycat Jack at work. The police know when and, in a vague sense, where the next crime will occur, and they are in a race against time to prevent new murders. There is lots of interesting historical detail about the unsolved crimes, as well as lovely shots of modern day London. The story, however, contains some odd ideas. For instance, the instance that DI Chandler "must decide who the 1888 killer was" in order to catch the current killer. The idea being that the current killer had picked a suspect to base his actions upon. How are we to know if the "suspect" the policeman chose was the same one that the current killer was modeling?? If nothing else, the series highlights the peculiar fascination that people still have with the over 120 year old unsolved murder. From academics, to deranged killers, to tourists, to armchair detectives, it seems that no one can get enough of the Ripper! There is also an extremely suspenseful sequence where the police are racing against time to catch the killer. The series was only 3 episodes long, so unless another killer decides to copy the copycat, I don't see how there could be more episodes. Still, it was fun while it lasted!